The 4th of July holiday is upon us here and I am (so) excited for a long weekend! While I may have some work to do still, it will be nice to enjoy some extended leisure time. Having lived in the city for so much of my life, it's very common to expect foggy conditions. (Except last year, we were pleasantly surprised to not have fog in the mix when we caught the fireworks.) While I may have to bundle up on the 4th, I'm wearing what I would want to wear before the 4th. I'll still have festive colors on but, with more layers. You look really feminine and pretty! Super cute look. I love the hat! Happy 4th! Very cute look! So spiffy,in a chic way of corse and love the little bows on the back of your shoes. You look absolutely gorgeous! I love it. Keep working it, girl! Too cute!! Loving this look and so perfect for the 4th! Obsessed with that hat! You outfit is so gorgeous and so perfect! I love that fabulous skirt and your hat is so cute! have a wonderful long weekend, ours was last weekend here in Canada! love your 4th of july outfit....and what an incredible wall!!! 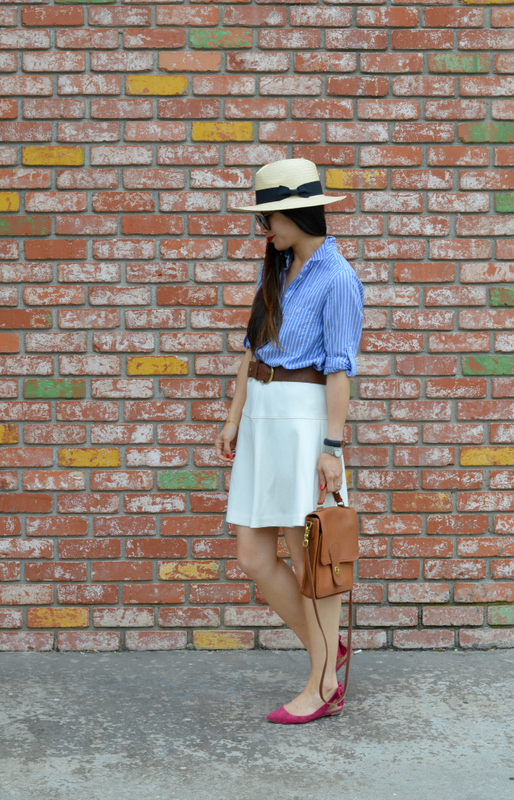 This is a perfect summer outfit for any day, but of course I love it for the 4th! Hope you enjoy the long weekend! I love this outfit, Nancy! Perfect for the 4th of July but not over the top in red, white and blue! I am in love with that hat and those shoes!! Enjoy your day and weekend!! Such a cute look! Love the shirt! Love the striped shirt and perfect casual outfit. The pink-red shoes are darling and the fedora is perfect on you. Happy fourth! Effortless chic - you look so smart and put together! I love your hat! Happy 4th! I know you've worn this shirt before, but I love it! So cute! Nancy, you look so cute! Your look is so sophisticated. Love that blouse and skirt girl. This is such a pretty and fresh look on you, I love it! The pop of color flats are perfect! A fantastically all america outfit! Love it, especially the hat. Such a cute outfit! This hat is perfection on you.